When Isa Gouverneur (then Art Director) and Paula Giraldo (then Senior Designer, now Assoc. 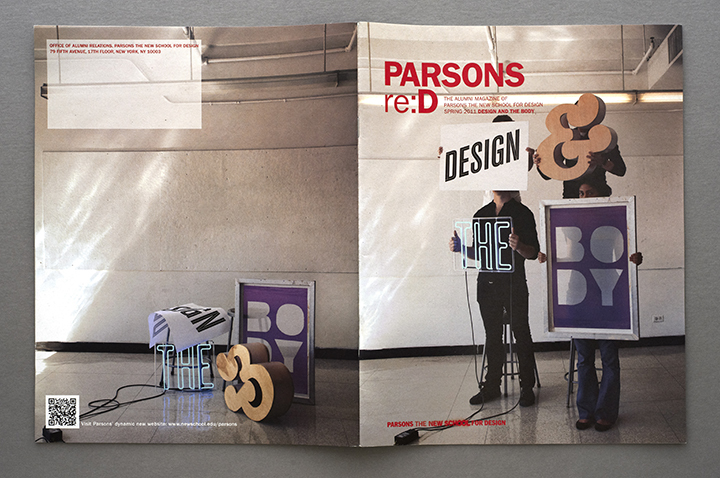 Art Director) of New School Communications and External Affairs Design Studio asked us last year to design the cover for 2011 Spring 2011 issue (“Design and the Body”) of re:D, the Parsons Alumni magazine, William Morrisey and I took on the challenge by creating an informal independent study project. We drafted students from both the AAS GD and Communication Design Programs to achieve a rich voice, as both groups brought different perspectives to the table. 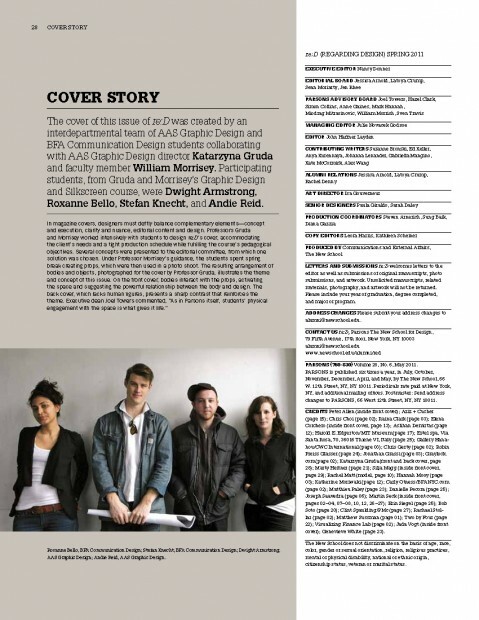 The team included Dwight Armstrong (AAS GD), Roxanne Bello (CD), Stefan Knecht (CD) and Andie Reid (AAS GD). The collaboration turned out to be stellar, and inspired all of us. It was an amazingly satisfying experience, topped off by being selected for the Certificate of Typographical Excellence by the Type Directors Club, for Typography 33. The work will also be shown at the 58th Awards Exhibition in New York. This is terrific news! Really great to see Parsons students (and faculty) getting recognition from the Type Directors Club for their excellent work. And since the TDC exhibit travels the planet, folks around the world will get a glimpse too!